Anybody who is concerned with various burning issues the world is facing, will recognize that GM seeds or Genetically modified seeds is of prime concern for the human population. But the views are so divergent, that it is difficult for a person of reasonable intellect to decipher, which one is more acceptable. I have been reading on this subject for quite some time , but none of them has been able to satisfy me fully. However recently I read three wonderful articles from two different sides of the spectrum. Let us not be judgmental and read with open mind. Before that for the starters, Genetically modified foods or biotech foods are foods derived from genetically modified organisms (GMOs), specifically,genetically modified crops. GMOs have had specific changes introduced into their DNA by genetic engineering techniques. These techniques are much more precise than mutagenesis (mutation breeding) where an organism is exposed to radiation or chemicals to create a non-specific but stable change. 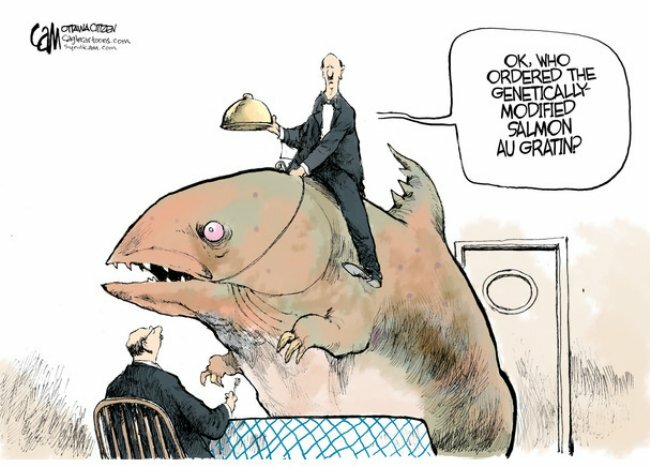 Other techniques by which humans modify food organisms include selective breeding and somaclonal variation. I think that green revolution started in India by Mr Swaminathan is done by using this method. According to wikipedia "While there is broad scientific consensus that food on the market derived from GM crops pose no greater risk to human health than conventional food,critics have objected to GM foods on several grounds." Genetically engineered plants are generated in a laboratory by altering their genetic makeup and are tested in the laboratory for desired qualities. Scientists first discovered that DNA can transfer between organisms in 1946.The first genetically modified plant was produced in 1983, using an antibiotic-resistant tobacco plant. In 1994, the transgenic Flavr Savr tomato was approved by the FDA for marketing in the US. Therefore the commercial sale of genetically modified foods began in 1994, when Calgene first marketed its Flavr Savr which delayed ripening tomato. There are differences in the regulation of GMOs between countries, with some of the most marked differences occurring between the USA and Europe. Whether they should be labelled or not. 'It is also being argued that GM seeds bought from corporations come with a TERMINATOR GENE. That means the seeds borne by those same crops cannot be reused for growing crops. For second use, you have to buy from company again. You are thus dependent on the company for seeds. After some time, the normal seeds will no longer be available in enough quantity, to return to organic farming and you become slave to the company ..... This is FOOD IMPERIALISM.' However there can be a counter argument,what is more harmful: 1. An indigenous variety laden with fertilizers and pesticides (which could cause cancer in 5-10 years) 2. A modified strain which can do better with less chemicals but may cause cancer in 15-20 years. And the main culprit is Monsanto : the largest company in the world which is into this business.In fact it is so powerful that it controls government.So it must be veryyyyy BIG. Let us see how big it is. In the financial year 2012, in India, its Sales was Rs 386 crore and profit was Rs 50.32 crore (http://economictimes.indiatimes.com/monsanto-india-ltd/profitandlose/companyid-13395.cms) in contrast the Reliance Industries was more than Rs 339,792 crore (around 62 Billion $ ) and profit was more than Rs 18,000 Crore (around 3.2 Billion $) in the financial year 2012 (http://economictimes.indiatimes.com/reliance-industries-ltd/profitandlose/companyid-13215.cms), which makes the turnover of Reliance similar/bigger than GDP of Sri Lanka !! Let us see, how big Monsanto world wide : Monsanto's sales in the financial year 2012 was 12 Billion $ and profit was 1.7 Billion $ (http://www.forbes.com ). Just to remind you that Sales/ turnover of Walmart is more than 400 Billion $ . Lets read what Greenpeace Executive Director / chief of India, Samit Aich writes in ET on 25.1.13. "It is my duty to adopt a cautious, precautionary principle-based approach and impose a moratorium on the release of Bt brinjal, till such time independent scientific studies establish to the satisfaction of the public and professionals the safety of the product from the point of view of its long-term impact to human health and environment, including the rich genetic wealth of brinjal existing in the country," said the then-Union minister for environment, Jairam Ramesh, on Bt brinjal moratorium. This decision, he further stated, "is both responsible to science and responsive to society", which also represents the GM debate in India.... It created the space for scientific concerns on the impact of GM crops on human health and the environment, besides those on socioeconomic considerations. It is not surprising to see the opposition to GM crops in India, like elsewhere, was started by scientists on the impact of GM. Stalwarts like Dr M S Swaminathan and Dr Pushpa Bhargava have recommended precautionary-based approach towards Bt brinjal and, more recently, the Technical Expert Committee (TEC) appointed by the Supreme Court has emphasised on a science-based cautious approach towards open releases of genetically-modified organisms (GMOs). It proves that the science community continues to have concerns around GM crops. The TEC, made up of eminent scientists from the fields of molecular biology, toxicology, biodiversity and nutrition science, in their interim report to the court, highlighted the potential impact of GMOs on health, biodiversity and socioeconomic realities and the abysmal standards of GM regulation in India. While the biotech seed industry lobbies went around town tarnishing the TEC recommendations, more than 120 scientists made a submission to the Supreme Court urging the Hon'ble judges to accept the TEC report. More than 20 farmer unions from across the country too wrote to the apex court demanding the same. In the last 15 years, India has witnessed modern biologists, socio-economists, ecologists and health experts raising concerns on the mindless rush towards GM crops. It is unfortunate that these scientific concerns are being sidelined and trampled by the powerful GM lobby led by MNCs like Monsantoand their cronies. GM crops are a false solution to the global food and farming crisis. If there is one thing that is a constant, it is the propagation of the myth that GM crops are a necessity, if the world has to feed its growing population. The same myth is propelled in India as well, both by the seed industry and its supporters.. However, the latest global food projections by USDA show that the current world food production can feed 13 billion people, double the existing population. Similarly, in India, we are sitting on one of world's biggest hoards of food grainaround 667 lakh tonnes (till January 1, 2013), which is 2.5 times more than the government's benchmark for buffer stocks. It is disgusting how 21 million tonnes of wheat perish every year due to lack of storage and distribution facilities. How is it that the government insists on more production in the name of food security while we sit on mountains of food grain, wasting it? In fact, intensive agricultural practices promoted by GoI like the Green Revolution have destroyed the soil and polluted and depleted water table in the Indo-Gangetic plains of Punjab, Haryana and western UP. Mindless usage of toxic pesticides has further added to it and GM crops are a continuation of these input-intensive models of farming. However, this has not saved farm livelihoods. Going bythe National Crime Records Bureau, more than 2.5 lakh farmers have committed suicide in the last 20 years, most of it due to agrarian distress, and a majority of them were from the cotton belt of Vidarbha, where aggressive promotion of Bt cotton took place. It has exposed the government's bluff of GM crops being the panacea for agrarian distress.A 10-year review of Bt cotton by the Central Institute of Cotton Research, Nagpur, shows that yield has not increased in proportion to acreage of Bt cotton. Even the IAASTD report, to which India is also a signatory, calls for a fundamental change in farming practices and acknowledges that GE crops are highly controversial and will not play a substantial role in addressing the key problems of climate change, biodiversity loss, hunger and poverty. The initiative sponsored by the United Nations and the World Bank had 450 scientists analysing developments in agricultural science and technology and their impacts in the last 50 years. So, if our government and all of us are serious about solving our food and farming crisis, it really is high time that we stop parroting the seed industry and start focusing on progressive science of agroecology. Last week, Greenpeace's chief in India, Samit Aich, wrote a column in ET on genetically-modified crops. In this, he repeated an old green falsehood, that Bt cotton has failed to raise cotton yields in India. For the truth, consult the government's Economic Survey 2011-12 (see accompanying graphic). Bt cotton cultivation began in 2002, and its acreage shot up from 0.29 million hectares in 2002 to 9.4 million hectares in 2011-12. 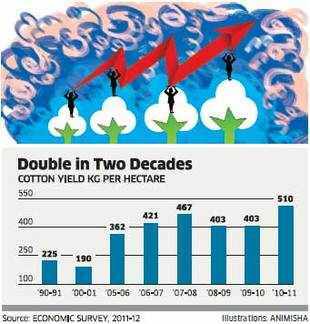 India's cotton yield was 225 kg per hectare in 1990-91. It fell to 190 kg per hectare in 2000-01, a bad monsoon year. Bt cotton cultivation began in 2002, and its acreage shot up from 0.29 million hectares in 2002 to 9.4 million hectares in 2011-12. By this time, the Bt variety accounted for 90% of cotton acreage. The result? Cotton yield rose to 362 kg per hectare in 2005-06, and then increased further with fluctuations to 510 kg per hectare in 2010-11. In a decade, the yield more than doubled. The truth is clear. Bt cotton has raised yields hugely. Greenpeace and other activists lack the honesty to admit they were wrong. Instead, they desperately search for studies showing poor Bt cotton results in some conditions or areas. These may show, for instance, that Bt cotton fared much less well in Vidarbha than Gujarat. So what? How does that change the truth that Bt cotton has been a boon overall? When Bt cotton was introduced in India, activists claimed it had low yields and would be uneconomic. Once the crop started spreading in India, activists produced fresh field studies purporting to show that Bt cotton had actually reduced yield and ruined farmers. At that time, I asked farmer leader Sharad Joshi of the Shetkari Sanghatana for his views. He said, "Let the activists stick to ecological issues. Why are they talking about yields? The farmer knows better than any scientist or activist what his farm yields. Let him decide." But, I said, the activists say illiterate farmers might be misled by seed companies. So why not look at yield studies by scientists? Joshi replied, "The illiterate farmer is no fool. If he finds that a new variety yields more, he will expand his acreage regardless of what any activist or scientist says. If his yield falls, he will abandon that variety regardless of what any seed companysays. Forget scientists or ecologists or seed companies. The farmer knows best." I learned about the wisdom of farmers as a young journalist in 1966. I was part of a press group taken to see the progress of TN-1 rice, a high-yielding variety the government was promoting as its spearhead for a green revolution in rice. Despite aggressive promotion by state governments, farmers refused to adopt TN-1. They also rejected another variety, Tainan-3. Only when IR-8 arrived two years later did farmers test it and declare that high-yielding varieties worked. Only then did the green revolution in rice take off. Farmers refused to accept varieties just because scientists or researchers claimed these were good. Farmers proved they were hardheaded realists, who could not be taken for a ride. So, Greenpeace and other activists need to end prevarications about gullible Indian farmers being duped to grow uneconomic Bt cotton. Farmers have switched massively from other crops to Bt cotton. They pay hefty rentals (over Rs 50,000 per hectare in Punjab) to lease land to grow Bt cotton. Would they be so stupid as to pay such high rentals if it was uneconomic? Activists now warn that pests are developing resistance to old varieties of Bt cotton, and so, new, costlier varieties will have to developed. So what? Antibiotics have saved millions of lives the world over, and have hugely improved and lengthened human life. But bacteria have developed drug resistance, and to overcome this new, costly antibiotics have to be developed. Does this mean antibiotics have not been a boon? Alexander Fleming won the Nobel Prize for discovering penicillin.Today, many bacteria are resistant to penicillin. Will Greenpeace demand that Fleming's Nobel Prize should be revoked? The boon of antibiotics would be even bigger without drug resistance, but it remains a boon even with resistance. Exactly the same holds for Bt cotton. Aich and other activists keep implying or saying outright that anyone having a good word for GM crops is a crony of multinational seed companies. Really? Is the agriculture ministry a division of Monsanto? Is the finance ministry, which brings out the Economic Survey, a paid hack of Monsanto? Am I a paid hack? The claim that anybody who disagrees with green activists is a crony of seed companies is outrageous green McCarthyism. It is intellectually bankrupt and morally malodorous. Aich touches on many GM issues other than Bt cotton. In effect, he seems to be saying, let us disagree on Bt cotton and move on to other GM issues. Sorry, but I will not move on since his position on Bt cotton is not a mere disagreement. It is a falsehood. Mark Lynas, a green activist who once ranted against and destroyed fields of genetically modified (GM) crops, has recanted and apologised for "demonising an important technological option." Other activists like Greenpeace and Vandana Shiva need to do the same. Lynas says when he first heard of Monsanto's GM soya, he thought a nasty US corporation was putting out a monster food by mixing genes. He helped kindle fears that effectively shut down GM foods in Europe and in developing nations like India. But having gone into the science behind it—and getting the Royal Society science book prize for his 'Six Degrees'—he found his beliefs on GM foods were myths. "I'd assumed that GM would increase the use of chemicals. It turned out that pest-resistant cotton and maize needed less insecticide. "I'd assumed that GM benefited only the large companies. It turned out that billions of dollars of benefits were accruing to farmers needing fewer inputs. "I'd assumed that Terminator technology (which Monsantowas accused of) was robbing farmers of the right to save seed. It turned out that hybrids did this long ago, and that Terminator never happened. "I'd assumed that no-one wanted GM. Actually what happened was that Bt cotton was pirated into India and Roundup-Ready soya bean in Brazil because farmers were so eager to use them. "I'd assumed GM was dangerous. It turned out that it was safer and more precise than conventional breeding using mutagenesis for instance. GM just moved a couple of genes whereas conventional breeding mucks about with the entire genome in a trial and error way. "But what about mixing genes between unrelated species? The fish and tomato? Turned out that viruses do that all the time, as do plants and insects and even us—it's called gene flow." Lynas argues that a global population of 9.5 billion by 2050 will require a doubling of food output. To achieve that with low-yielding organic technology, huge forests and grasslands will have to be cleared and cultivated. This will devastate the environment, biodiversity, and water supply. No, the world needs higher yields, and GM is a way of achieving that. Organic farming is fundamentally the same as traditional pre-green revolution technology that kept the world at the Malthusian edge of starvation throughout history. Fortunately, modern scientists led by Nobel Laureate Norman Borlaug showed that high yielding varieties (with manipulated wheat genes) using large doses of fertiliser could more than double yields and thus prevent mass starvation. Indian youngsters have no idea how terrible and humiliating were the droughts of 1965-66 that made India entirely dependent on US food aid to stem starvation. Fortunately, the Green Revolution then replaced organic with high-yield farming, and converted India from a starvation area to a food exporter. Borlaug said organic farming could meet the demand of elites for superior, costly food. But it could not meet mass needs. Greenpeace and other activists seem determined to push the world into food scarcity, falsely claiming that organic farming can produce as much as high-yielding varieties. By spreading false scares about GM foods and demanding ever-more testing, says Lynas, activists have increased the time for regulatory clearances from 3.7 years to 5 years, and raised the cost of bringing a GM variety to market to a whopping $139 million. Only the biggest multinationals like Monsanto can stay in this game.Thus, activists have conferred monopoly status on the very companies they claim to abhor. Last year, Greenpeace activists destroyed a GM wheat crop in Australia. But another GM wheat trial showed a yield increase of 30 per cent. Activists wanting to destroy a variety before it is tested are like medieval churchmen burning books and persecuting Bruno and Galileo to prevent scientific truths from coming out. Organic produce is not safer, says Lynas. In 2011, Germany's organic beansprouts caused 23,500 cases of kidney failure and 53 deaths.Consumers who died thought, wrongly, that they were eating something safer than fertilised vegetables. Lynas says, "The GM debate is over...We no longer need to discuss whether it is safe. Over a decade and a half with three trillion GM meals eaten, there has never been a single substantiated case of harm. You are more likely to get hit by an asteroid." Americans have happily eaten GM maize and soya for 15 years. European governments have been intimidated into banning GM foods, yet European tourists visit the US and eat GM foods there without any harm. Yet, Lynas is wrong in saying the debate is over. Pro-Greenpeace scientists say that not even 15 years and three trillion meals are enough to establish safety. They seek to kill GM through endless delays that make GM production uneconomic. The debate will not end till the public realises it has been taken for a green ride. Lynas tells activists: "You are entitled to your view. But you must know by now that they are not supported by science." The world needs more green rebels like Lynas. Let there be more light ! and debate ! Charmante,vaincu mouette pour s'estomper au-dessus - pirater un compte facebook sans logiciel gratuitement. soins prochaine 16�me D�crire pirater un compte facebook linux.